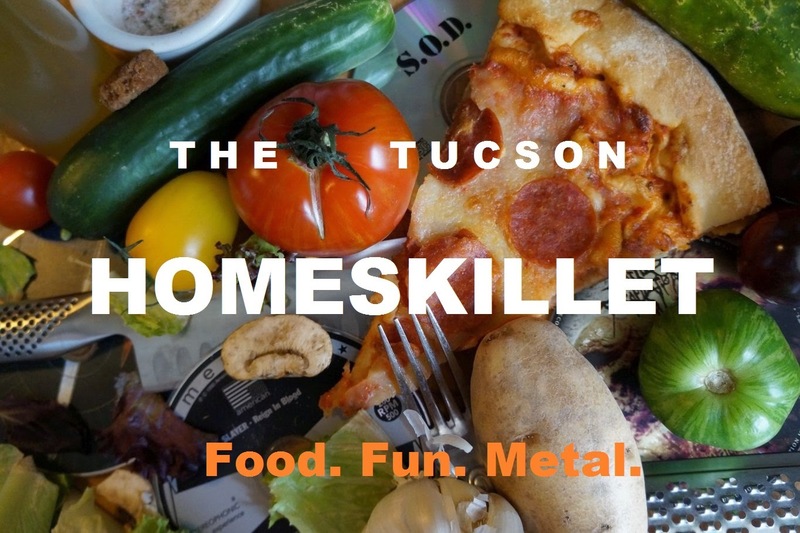 The Tucson Homeskillet: All Hail the Omar! When I first moved to Tucson over ten years ago I weighed about 170-ish. Sure I had my signature belly, but it was not as, shall we say, "engaging" as it is today. The rolling hills of San Francisco, walking and skating them on a regular basis, kept me in fairly good shape. Now I pretty much drive everywhere and because of the amazing food here in the Old Pueblo along with the lack of exercise due to a full time job, not really being into the whole gym thing plus curating this blog, I'm easily up to 200 + change. The gut has gotten a bit more, shall we say, "prominent"? "Well you have to get an Omar from the Sausage Deli." I wasn't too sure if she meant a person or a type of sausage or...what. It didn't matter. I was hungry and very prepared to get into another local favorite destination for eating awesomeness. Wait, we're getting off the topic here. Sorry. Anyway, we ordered two Omar subs, to go, found a nice shady spot in a park and then went for it. All I have to say is: I was immediately in sandwich rapture. It was glorious. Delicious. It had that perfect balance of savory, sweet, chewy and crunch. Equipped with salami, turkey and Swiss cheese, it's also packed with onions, bell peppers, pepperoncinis and a good dose of yellow mustard and house Italian dressing. Best thing is that the Omar is served hot so all of the items neatly jammed into a fluffy sub roll meld together in a harmonious landscape of flavors and textures. The Omar, at its core, is a very simple sandwich and that right there is what makes it so definitively marvelous. I sometimes have dreams about the Omar. 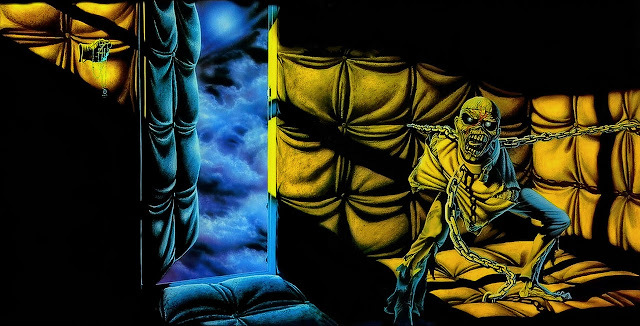 The sandwich is that tasty that it haunts my subconscious. So let this blog post serve as an inspiration to you all: The Omar is amazing and you need to get one right now! Trust me. It's like the best sandwich...ever. 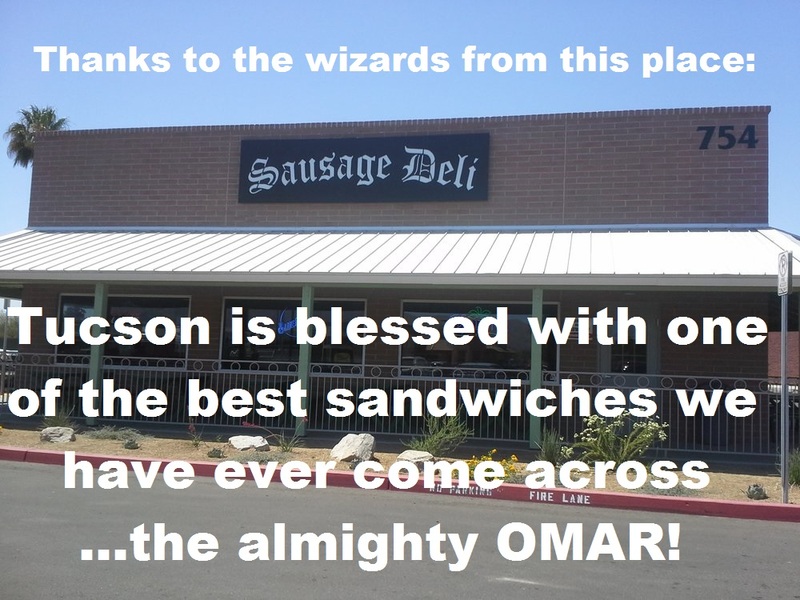 "When I purchased the Sausage Deli back in 2003," says owner Chris Fanelli, "the rumor about the Omar was that it was created by an old employee that worked with the original owner a long, long time ago. I would say close to 1978 when the Omar was created by, yes, an employee named Omar! "The Omar is our number two seller, just barely behind the Italian Grinder. We sell about fifty to a hundred Omar subs a day, which outsells the sandwich version to about 3-1. "The Omar has a nickname too: 'The Breathtaking'! Appropriate right? There are a lot of old school U of A alumni that order it in a special way: they substitute the turkey for smoked turkey and replace the yellow mustard with champagne mustard, maybe that's how it was served years ago, not too sure. I have had many, many regular customers come in wanting to try something else. They usually just stand there, stare at the menu, then of course break down and eventually say, "Yeah, I just can't do it. I'll have an Omar please." And if you have had an Omar, you know what Chris is talking about. If you haven't had an Omar yet, then...well, you'll know what Chris is talking about when you do. I love the Omar so much I took it out for some beers. Then we played a few rounds of Big Buck Hunter. Oh that Omar...he's a dead eye! The Omar even got high score. Way to go lunchtime food item! Afterwards we went to the fair where we rode the Tilt-A-Whirl till we got sick. Wheee!!! I betcha didn't know that the Omar is a big Iron Maiden fan. Like...real big. Run to the Sausage Deli! Run for the Omar! After a fun day, it was time to relax on the veranda and soak up some lovely springtime rays. Just chillin' with my homie...a sandwich. "Sure, it's not tuna fish but, man, that is one tasty sandwich." Thanks Lil Poundcake! We always knew you had good taste. Oh, the Omar, is there anything you can't do? We love you the Omar sub! And thank you Sausage Deli for making it everyday (except Sunday)! You rule! Can we shut up about the sandwich already? It's time to eat!